The Mysterious Forest – Bad Dream or Fantasy? So begins the inaugural chapter of Daniel Lieske’s The Wormworld Saga, an online digital graphic novel that has taken the internet by storm. Now into its seventh year, this wildly successful child-focused story has spawned numerous printed anthologies, and now, thanks to the help of the publisher Iello, its very own board game. 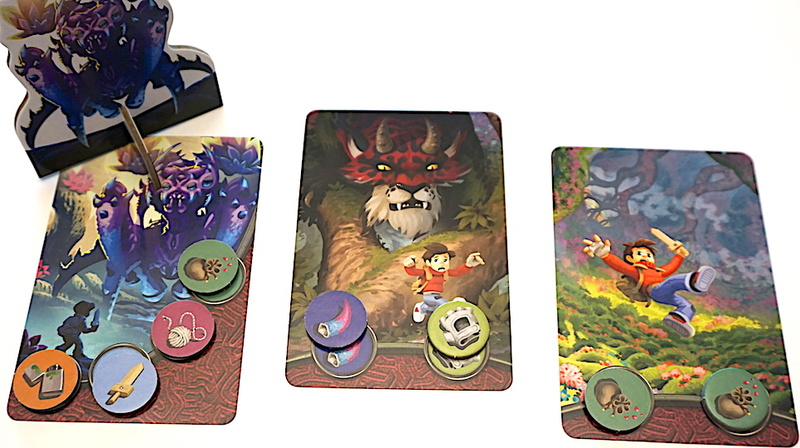 The Mysterious Forest is a 2-4 player memory game for children ages 6+, set in the Wormworld. In it the players take the on role of the story’s protagonist, Jonah, as he seeks to cross the Mysterious Forest and fight the Queen of the Draconia. The setup of The Mysterious Forest can be little difficult for young players. It isn’t particularly challenging, but there are a few steps involved. First, players shuffle all of the cards and put them into piles by their appropriate card type: Forest cards, Wanderer cards, and Final Battle cards. 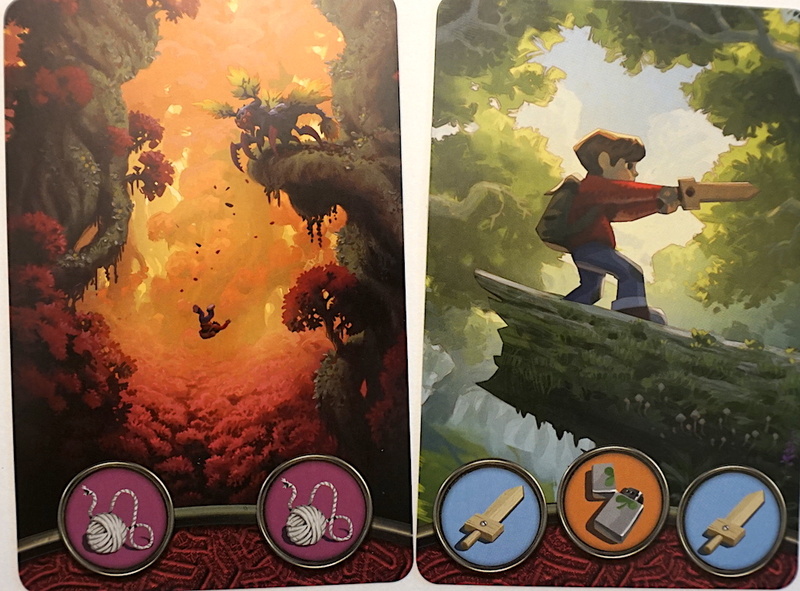 Then, the players build the path through the forest with these cards. The first time you play, line up four Forests, a Wanderer, two more Forests, and a Final Battle card. This can be changed for future plays, a fact we will address later. Each copy of the game comes with a Jonas figurine who is placed at the beginning of the path through the Forest. Once the path is created, players need to sort through the tokens (there are a lot of them) and separate them into their respective piles. They then place four Loki tokens face down on the backpack board in four of the slots. The Mysterious Forest progresses through three phases. In Phase 1, the players are scouting the path. Each player takes turns looking at progressive cards along the path, committing to memory the Equipment on the cards. So, for a four player game with the basic setup listed above, each player will have looked at two cards and tried to commit those Equipment to memory. It’s important to only look at each card once! That’s part of the challenge. In Phase 2, the players are preparing for the journey! Now that they have (hopefully) memorized the Equipment, they can fill their backpack with the right tools to make it through the Forest. 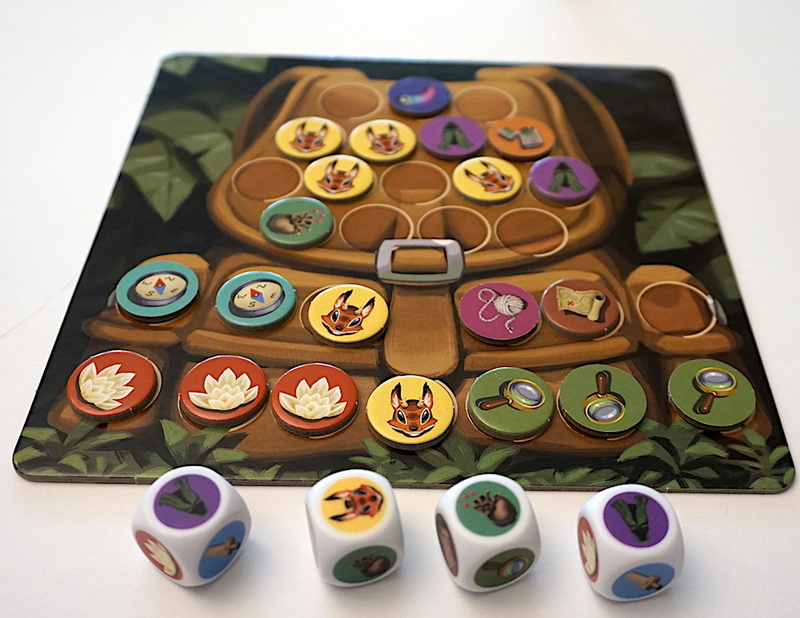 Each player rolls the four dice and chooses two of the faces and taking the tokens for that Equipment and putting them in the backpack. Players *must* take Loki tokens if Loki icons appear on the dice (and kept face down). Exchange an Equipment in your Backpack with one in the Reserve. Once the players fill the backpack, it is time to journey through the Forest! Phase 3, the Expedition, comes next. The players reveal the path one card at a time and use Equipment from their Backpack to complete it. If someone forgot a piece of Equipment, they can call out to Loki for help, using a Loki token, and doing whichever ability is on that given token. Finally, if the players managed to remember all of their Equipment, they come to the Queen of Draconia. She also has Equipment requirements. If these too are met, Jonas is successful, and the players win! The Mysterious Forest is a simple, straightforward memory game. It doesn’t introduce any new, novel mechanics, and there are a few steps to get going, but there isn’t a lot of confusion in gameplay. We found the game played best with an adjudicator. A parent or older sibling could move the game along as each card on the path was completed, and embellish the story of the game to make it interesting. The art in The Mysterious Forest is spectacular. In fact, I read some of the source material online because the game was so beautiful. The iconography is clear, and the symbols and characters are charming. The game was very easy with the initial configuration. Fortunately, Iello filled the back page of the manual with many different ways to make the game more difficult. Beyond this, the experience is always different since the game progress is built through randomly shuffled cards. The Mysterious Forest remains an engaging experience despite the relatively straightforward game play. The game plays quickly as well, with the 20 minute box estimate being right on target. Our children weren’t familiar with The Wormworld Saga prior to playing the game. There isn’t a strong narrative to carry the game forward, but there are enough set pieces to conjure up a general sense of the tension of the world. The Mysterious Forest is a wonderful memory game with beautiful art and light storytelling elements. For fans of this series, this game is definitely something to consider bringing home. We found it to be a little pricey (around $25), but the production quality is excellent and it is fun to play. Are you interested in exploring The Mysterious Forest? Get your copy today! 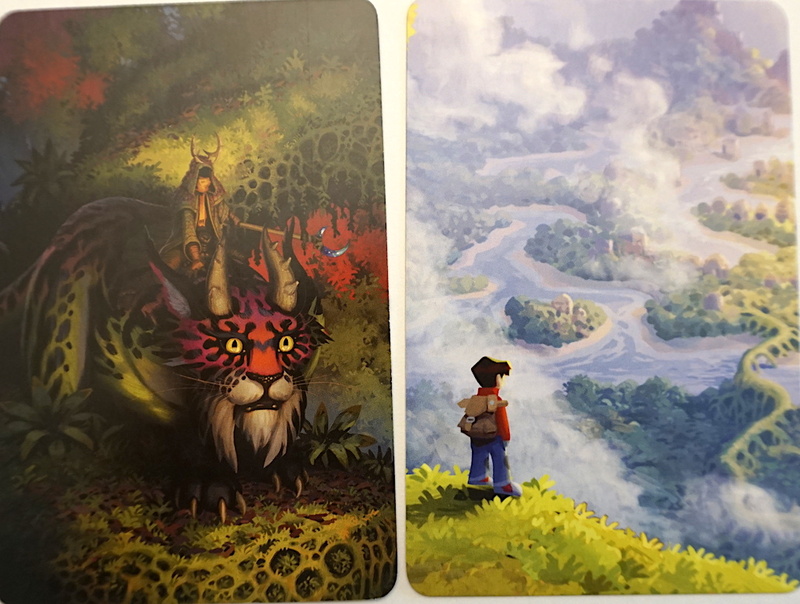 The Family Gamers received a review copy of The Mysterious Forest from Iello.